Bring water and rice to a boil in a medium saucepan. Reduce heat to low and cook, covered, for 50 minutes. Remove from heat and let stand for 5 minutes, then fluff with a fork. Let cool slightly, then chill for at least 1 hour or until cold. 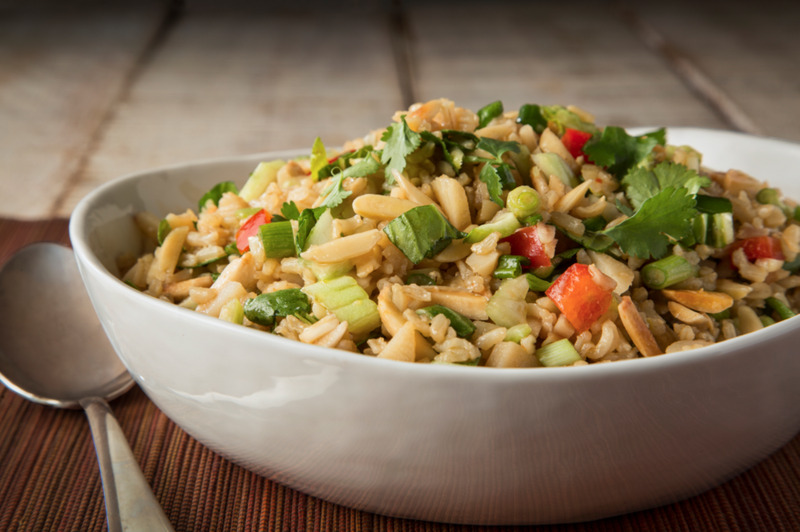 While rice is chilling, whisk together all dressing ingredients in a large bowl. Add rice and toss well to coat. Stir in remaining salad ingredients. Best if chilled for 1 hour to allow flavors to blend, stirring occasionally. Salad may be prepared a day ahead without the almonds, bok choy and cilantro. Stir in these ingredients just before serving. Mariani Nut Company is one of the largest, privately-held, walnut and almond processors in the world. Mariani Nut Company has developed strong partnerships with customers who demand the highest quality nuts obtainable and insist on continuous improvement. These partnerships with companies in a variety of sectors including confectionary manufacturing, cereal and ice cream have pressed us to implement an aggressive investment strategy when it comes to manufacturing capital. This strategy has allowed us to obtain a position of leadership regarding quality in the industry. Mariani walnuts and almonds reach virtually all regions of the world. Our products find a home not only here in the U.S., but a significant tonnage is also shipped to Europe, Asia and Australia.